“”Remember my son, the universe is a big place—perhaps the biggest! All of space and time, and everything contained therein, is called the universe. This includes what we can see, what we can't see, what we know we can't see and what we don't know that we can't see. Even outside the universe is still part of the universe (though some think that our universe is in fact part of a larger "multiverse" meaning our concept of what constitutes the universe may have to change). Where it came from nobody knows, except, of course, creationists who know that God was the one that made it (and specifically, their God). Where God came from, nobody knows. So we're all in the same boat, really. It doesn't really matter that much, if you think about it. While some people think the universe was created over a six-day span around 6,000 to 10,000 years ago, the facts as measured show them to be painfully wrong, unless you subscribe to Last Thursdayism or a similar idea, but that is irrelevant conjecture here. 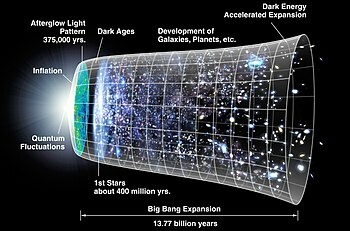 The universe seems to have formed approximately 13.8 billion years ago in a rapid and massive expansion of space-time called the Big Bang. After the initial inflation, the energetic particles cooled, and nuclear reactions created what was to become matter, which eventually clumped together to form galaxies and stars. Over the course of stellar evolution heavier elements were produced, leading to later generation stellar systems having planets sometimes largely made of those heavy elements - rocky planets. Our solar system is roughly 4.5 billion years old, and features a handful of such rocky planets and smaller debris, along with four gas giants, which are largely composed of lighter elements and compounds. After a long period of cooling, our planet became hospitable to the evolution of the very complex organic compounds which are now known to be abundant in the universe. One collection of said compounds typed this not long ago, while another collection is now reading it. When seen at the largest scales, the Universe shows an infinite set of turtles, one below the other a structure in which galaxies and clusters of galaxies are arranged in long, web-like filaments and walls surrounding large voids in which there's little more than dark energy and a bunch of isolated galaxies, with galactic superclusters tending to be in the nodes of the cosmic weave as if often known, growing at the expense of the filaments, while voids are getting larger and larger as the Universe expands faster and faster. This has been predicted by theoretical models as well as computer simulations. As predicted, too, by theory (the so-called ΛCDM model, in which a cosmological constant Λ, associated with dark energy, and Cold Dark Matter are present) and confirmed by observations things are growing "bottom-up", as small galaxies and clusters of galaxies combine to form larger galaxies and clusters and so on. The origin of these structures is attributed to matter overdensities caused by quantum fluctuations formed after cosmic inflation, that erased almost all of those that appeared at the very Big Bang. For universes filled with nothing but matter, the fate of the universe is tightly related to its geometry, as described below; i.e. if space at large scales is curved or not. Three basic possibilities, called the Friedmann Univserses, exist, related to its density of matter and energy. Note, however, that out universe does not exactly fit into any of these categories. They are often found in popular scientific sources, especially older ones, and scientific textbooks from the 1990s and earlier because we only found out about the dark energy in 1999. However, keep in mind that they are superseded as possible descriptions of our universe. An open universe, that has a negative curvature. In this scenario, the angles on a triangle sum less than 180° and two parallel lines will diverge sooner or later. This universe has less density than the needed to stop its expansion and will keep expanding forever. A flat universe, that has no curvature. Here, the Euclidean geometry taught in schools applies: the angles of a triangle sum 180° and two parallel lines will always be parallel. It has just the critical density needed to stop its expansion... after an infinite time. A closed universe, that has a positive curvature. Triangles in this type of Universe see how their angles sum more than 180°, and two parallel lines will end converging. This one is so dense that sooner or later will collapse into a Big Crunch. Present data support a flat Universe with no (measurable) curvature and the critical density. This does not mean the Universe has to be infinite as is usually stated, since it isn't filled with nothing but matter, but also a significant amount of dark energy which behaves differently. Also, there're models of finite Universes with zero curvature such as the torus (a dougnhut-shaped Universe. Mmmmm...) or a horn-like structure, that are compatible with our observations or its curvature could be so small that cannot be measured with current equipment. What is the size of the Universe? A very important caveat is to differentiate the observable Universe of the entire Universe. The former, of course, corresponds to the part of it that can be seen from Earth and can be seen as a sphere centered on us with a diameter of around 93 billion light years. We don't know what lies beyond that horizon, and because of the expansion of the Universe "we" will not be able to observe much farther away than that in the distant future (in fact we'll actually see less and less), but it's thought that very likely more of the same stuff that forms our corner of the Universe. The size of the latter is unknown and ranges from some past suggestions of an Universe actually smaller than the observable one, and in which distant galaxies would actually be images of closer ones whose light had been able to circumnavigate it, to estimations based on probabilistic calculations or in predictions based on the theory of cosmic inflation. In that way, we have lower limits that range from 5 or 250 volumes. If the inflation theory is right size estimations range from an impressive 3x1023 times larger than the observable universe  to at least a mind-blowing 101010122 megaparsecs , which is practically infinite. This assuming it's not actually infinite, as stated above. The end of the universe is an interesting topic, hypothesized about by many people over the millennia. Until the modern "Scientific Age," the future of the universe was dominated by religious interpretations. By and large in Abrahamic and European-descended religions these involved some kind of ultimate "Day of Judgement" or universal catastrophe. Other faiths have envisaged some form of continued everlasting existence. Almost all of these ideas are initiated by an unwillingness to believe in personal discontinuation (death), and are still dealt out by the "priestly classes" as either comforts: "Don't worry about your condition here on Earth. Come the day you shall join the Lord in Heaven," or as threats: "If you don't obey the rules handed down then, come the day, you shall not be saved." Most of these scenarios depended on the self-aggrandizement (or cupidity!) of those in charge and the ignorance (or stupidity) of those having them lain upon them. As the educated began to explore the world around them and as education diffused downward in society, questions began to arise regarding the beginning and end of all things. Envisaging a universe without a thinking, guiding force with a constant influence on events has, for most of recorded history, been a necessarily covert belief as such ideas have brought opprobrium and sanction upon anyone brave (or dumb) enough to express them. This is still the case in some parts of the world. Natural philosophers, the precursors of today's scientists, began the description of the world about them in all the ancient civilizations of the world but very few dared to pronounce an atheistic worldview. The discovery by Edwin Hubble of the expansion of the Universe led to the concept of the Big Bang and the origin of the universe but its ultimate fate has long been the subject of discussion and controversy. It is now believed that the total matter and energy of the universe is mostly (at least 90% and up to 97%) physically undetectable (by any traditional means) but its presence can be inferred from its effects. This matter and energy has no effect on "normal" matter other than gravitationally. It is calculated that there is much mass locked up in dark matter helping to hold galaxies together. This is required in order to explain the rotational velocities of stars at the outer edges of galaxies. With only the observable amount of mass, the outer stars should "spin off" and be lost to the galaxies. Dark energy is believed to permeate all of space and to have a negative gravitational effect, thus causing all matter to accelerate away from its neighbours. (Imagine it as the pressure causing a balloon to expand. It is this energy which seals the eventual destiny of the Universe as a variant of (1) and (2) above i.e. ever increasing expansion, or almost so. The presence of this dark energy is what leads astrophysicists to believe that the fate of the universe, often known as the Big Freeze (or Big Whimper), is to be a low temperature (10−30Kelvin) sea of photons with some stray electrons and positrons. Basically, the whole process passes through the 'using up' of available hydrogen and helium, and the 'evaporation' of both all matter that is not in the form of black holes via the eventual decay of protons and neutrons and of black holes via emission of Hawking radiation. This will take a length of time of up to 101500 (yes, that is ten to the one-thousand, five hundred) years. This is what awaits to a flat or open universe. If the current rate of cosmic inflation increased even faster than a cosmological constant implies and the dark energy is of a form known as phantom energy, the universe could cease to be habitable long before everything fades out. Depending on the model, in a mere 20 billion years , the universe could be expanding so rapidly that everything, from galaxy and galaxy clusters at first to finally the very own subatomic particles at the very end would be ripped apart. This is called the "Big Rip". This end, however, would presuppose that the dark energy density does not remain constant over time, but actually increases, causing the acceleration of the universe to grow indefinitely. So far, no increase in the dark energy density has been measured and it is presumed to be stable in the standard model of cosmology. If that is true, in several billion years of time, the far reaches of the then-observable universe will accelerate away from us so quickly that they will again leave the observable universe in an outwards direction. Over time, more and more galaxies will be affected by this until, at the end, a very old Milkdromeda galaxy will be the only thing visible in the entire universe. The final fate of the universe will then be the Big Freeze above. Another proposed Game Over could come if the fabric of the Universe was not totally stable. In this scenario, the transition to its stable phase would take the form of a bubble of true stable space that would expand at the speed of light devouring the old Universe, with no possibilities of seeing the thing coming or noticing its effects, and transforming everything once inside into something new, but at the same time causing there a collapse to a central singularity. It's unknown when and where this could begin, so sleep well. Various times "close" to the end have been described, or occupied by characters, in science fiction. There's a nice restaurant at the end of the Universe, which is animal-friendly, allowing pet monkeys a seat at the table. After a hard night's carouse, the Big Bang Burger Bar at the other end of town is a great place to get a mighty wadge of chips, for soaking up the undesirable toxins that invariably accompany your intoxicant of choice. The "universe" is jargon in thermodynamics. The universe is made up of the system and the surroundings according to thermodynamics. According to the Second Law of Thermodynamics, the entropy of the universe tends to increase with time. In a constant-pressure system, heat leaves the system in an exothermic process, but energy is conserved. While it is a term most commonly associated with science fiction, cosmologically speaking, the "multiverse" is the hypothetical realm which contains our universe, as well as many possible others. Many physicists do take multiverse theory kinda-sorta-seriously, including Andrei Linde, Alan Guth, Stephen Hawking, Michio Kaku, David Deutsch, Max Tegmark, Steven Weinberg, Hugh Everett, Raj Pathria, Alexander Vilenkin, and Brian Greene. “”For a start, how is the existence of the other universes to be tested? ... [I]nvoking an infinity of unseen universes to explain the unusual features of the one we do see is just as ad hoc as invoking an unseen Creator. The multiverse theory may be dressed up in scientific language, but in essence it requires the same leap of faith. Until we develop instruments which can actually see outside of the universe, or create a universe in a jar that we can poke with scientific instruments (slightly more likely) this remains unfalsifiable. Alternatives to the multiverse are Ekpyrotic cyclical universe (Paul Steinhardt and Neil Turok), fecund universe or cosmological natural selection (Lee Smolin), conformal cyclic cosmology (Roger Penrose and Vahe Gurzadyan), cyclical Baum–Frampton model (Lauris Baum and Paul Frampton), loop quantum cosmology (Martin Bojowald, Abhay Ashtekar and Carlo Rovelli), eternal static universe, or the simulated universe (Nick Bostrom). And of course Goddidit. Depending on the theory, the multiverse have a finite size and age, as in eternal inflation, or be infinite and ageless, as in the many-worlds interpretation. Though some theories involve a finite but ageless multiverse, or an infinite but finitely aged multiverse. ↑ Was there a before for the Big Bang to be after? ↑ Again, creationists know that their God has always existed. ↑ Leaving aside Dark energy, that is, that is for now accelerating its expansion. ↑ This subject is constantly changing, so beware of what you read on the web - it may be out of date. This page was last modified on 6 March 2019, at 22:08.